The English Bulldog is one of the most popular dog breeds in the world, but it’s also one of the unhealthiest. An upsetting new analysis now shows that these stocky, wrinkly-faced dogs lack the genetic diversity required to improve the breed, and that their current level of health is as good as it’s ever going to get. In a new study published in Canine Genetics and Epidemiology, researchers from the University of California’s Center for Companion Animal Health have shown that the English bulldog’s highly constrained genetic diversity will make it difficult—if not impossible—for breeders to create new-and-improved versions of the canine from existing genetic stock. This startling lack of genetic plasticity is the result of the breed’s small genetic base (which was derived from 68 individuals back in 1835), intensive inbreeding, and breeders’ selection of specific‚ and often extreme, physical traits. We found that little genetic “wiggle room” still exists in the breed to make additional genetic changes. This isn’t good news for a breed that’s already beset with serious health problems. Bulldogs don’t often live beyond six years, and their lives are often marred with serious health problems, including hip dysplasia, respiratory issues, cancer, interdigital cysts (cysts that form between the toes), allergies, and cherry eye (a protrusion of the inner eyelid). The folds on the bulldog’s iconic face make them susceptible to infections, and their their abnormally small nasal cavities make it difficult for them to stay cool, making them prone to overheating and hyperthermia. Many of these health issues are the result of breeding efforts designed to give these dogs their dramatic appearance. Large portions of the bulldog’s genome have been altered to attain these morphological changes which has in turn resulted in a tremendous loss of diversity in the part of the genome responsible for normal immune function. 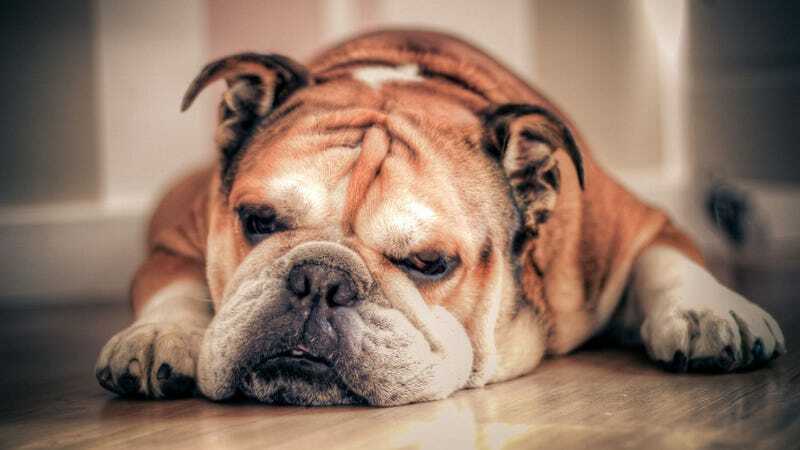 The lead author of the study, Niels Pedersen, says that this breed has reached the point where its popularity can’t justify the health problems that the typical bulldog is forced to endure and, sadly, not much can be done at this stage. The bulldog’s genome has been steadily changing for hundreds of years, but these alterations have become particularly pronounced in recent decades. Breeders are doing the best they can to manage the little diversity that’s left, but many bulldogs are still sired from highly inbred parents. Pederson says that eliminating all the problematic mutations won’t solve the problem because it will only serve to further reduce genetic diversity. Further modifications designed to increase diversity—like introducing rare coat colors, making the body smaller, or adding more wrinkles to the coat—won’t improve the situation, argues Pederson. To study the genetic constitution of this breed, Pederson and his colleagues examined 102 English bulldogs—87 from the United States and 15 from other countries. These dogs were genetically compared to an additional 37 English bulldogs, all of which exhibited serious health problems. This was done to determine if the genetic problems were the result of commercial breeders or puppy mills, neither of which turned out to be the case. In an effort to address this problem, some Swiss breeders have started to mix English Bulldogs with the Olde English Bulldogge—a recently created American dog breed—to create a “Continental Bulldog.” This “outcrossing” of breeds could improve the health of bulldogs, though Pederson is skeptical. At the same time, some breeders complain that the new mixed breed is not the same thing as a purebred English bulldog. Perhaps the time has come for these “purist” breeders to start paying more attention to the health of these dogs instead of their appearance. But as this new study points out, it may already be too late.